- FREE DELIVERY WEEKEND ? Give your loved ones the support they need this Christmas with a boobydoo gift voucher. Why not treat yourself too? 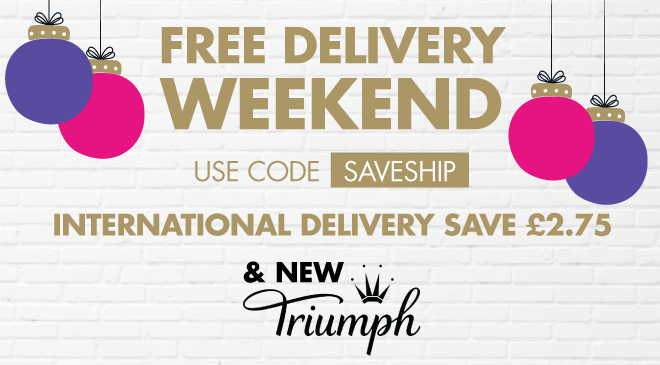 Check out the new collection from Triumph, get all your favourite styles in brand new colours and prints! Use code SAVESHIP for FREE UK DELIVERY | International orders will save £2.95 on shipping. PLEASE NOTE: You must fill out delivery address first, then apply the code for it to work. International is automatically applied. Don’t forget to order before December 22nd to ensure Christmas delivery.